For the last seven months, I've really missed tomato sauce while on the AIP diet. 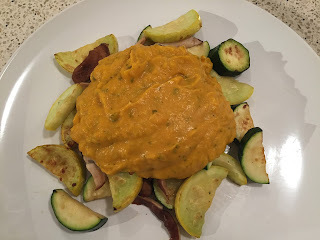 I've made a few "nomato" sauces from pureed winter squash, beets and seasonings, but it was just missing that savory, robust taste you get from a tomato sauce. I found several kabocha squash sauce recipes online, but most of them were filled with heavy cream, cheese and spices I couldn't have. I decided to try to make something that was vegan and AIP-friendly, and it worked! I'm happy to say I found a replacement that makes me not miss tomato sauce one bit! I could have eaten the entire pot of sauce. It smelled wonderful while cooking and was absolutely delicious! This is my new favorite! This recipe will serve 4. Preheat oven to 350°F. Cut the kabocha squash in half width wise. Scoop out and discard the seeds and stringy pulp. Pour a thin layer of water (about ¼ cup) into a baking dish and place the squash halves cut side down in the water. Bake the squash until it is fork tender (an inserted fork goes in and out with ease, about 45 minutes). Once the squash is cool enough to handle, scoop out the flesh from the skins and transfer to a food processor or blender. Puree until smooth. Discard the skins. In a medium sauce pan, warm avocado oil over medium heat. Add the onion and sauté until soft (4 – 5 minutes). Stir in the kabocha squash puree and cook for an additional minute. Slowly add the coconut milk into the squash mixture, making sure it is completely incorporated before the next addition. Add the nutritional yeast, mace, garlic and ume plum vinegar, stirring to incorporate. If you want sauce with a thinner consistency, stir in vegetable broth or stock until desired consistency is achieved. Remove the sauce from the heat and add parsley and lemon juice. Taste your sauce and season with salt, pepper and additional lemon juice if needed. Serve on spiralized vegetable noodles, cooked veggies, cooked sweet potato starch noodles (Korean glass noodles) or anything else you please! It seems like most every fall and winter, I need to become a mad scientist and figure out a new work-around recipe for an old seasonal favorite food. The latest experiment for me was how to make a pumpkin pie AIP-friendly. By omitting the crust, that makes things much easier (and cuts down on the calories! ), but the filling still needed some adjustments. I always struggle with what to do about egg replacements. I recently made a homemade powdered egg replacer that has worked very well in several recipes, and this was another success story! For this particular recipe, I made mini pies in coffee mugs. If you're using smaller ramekins, you could make 8 servings. For larger mugs, this makes 4 larger servings. Without the crust, the 4 larger servings seemed like the right size. The consistency of this comes out like a cross between a pudding and a mousse. It sets up, but it's not as firm as a baked pie would be. However, I found the light consistency to be much nicer, and all my guests who ate it agreed. Anyone who tries this would find it impossible to believe this is free from gluten, egg, dairy, corn, grains and nuts! If you like pumpkin pie, you'll love this. And no oven is required! Serving is also a breeze, with everything pre-portioned into cups. 1 15 oz can pumpkin puree (about 1.5 cups) - if you have homemade pumpkin, even better! Combine all ingredients above into a small saucepan. Stir on low heat for about 5 minutes, until all combined and heated through. Pour into small mugs or ramekins. I used a ladle to make portioning out easier. Set in the refrigerator for at least 2 hours or overnight if preparing ahead of time. One of the most difficult things to substitute in both an AIP and vegan diet are eggs. They are an important part of many recipes to bind ingredients together, help them rise or thicken. I was using chia and flax seeds for a while, before I had to cut out seeds. Store-bought egg replacers were also no longer an option due to the cornstarch and potato starch. I had to find something! I found a homemade egg replacer recipe online, but it still wasn't AIP, so I decided to try to make it work with some modifications. I'm happy to say, it's worked in making flatbread, breadsticks, pumpkin pie, and a few other items. I store my egg replacer in a Mason jar with a screw-on plastic lid with the instructions written on a piece of masking tape on the side. If you don't have a half tablespoon measuring spoon, use a rounded 1.5 teaspoons. This recipe works best for recipes that are not egg-heavy. This would not work for a quiche, meringue or something along those lines! Make sure to put items into the oven right away when using this egg replacer. The recipe looses its oomph if you wait too long. I've also found that having a bit of lemon juice or apple cider vinegar in the recipe helps it to rise more with this egg substitute. One of the first things I was most shocked that contained corn was baking powder. I couldn't understand why it contained corn. Now, I ask myself that question about 10 times a day about many different things, so it's the norm, unfortunately! After doing some Google searching, I found making your own baking powder is quite easy. You just need three ingredients, and you'll be all set. In fact, if you're on AIP or a paleo diet, or avoiding corn or grains, you probably already have these ingredients handy! This homemade baking powder can be used 1:1 as you would store-bought. This recipe will make one cup of baking soda. If you're going to also make homemade egg replacer, I suggest at least doubling this recipe, so you'll have enough. Combine ingredients with a whisk and mix well. Store in a tightly closed container (labeled, so you know what it is!) to prevent activation of the ingredients from moisture. One of my favorite soups is pumpkin or winter squash soup. It's not only delicious, but it's very festive and great for the holidays or get-togethers with friends and family. While on the AIP diet, I had to make some changes to the spices I use for cooking, and this recipe is no exception. I find that this particular recipe is more tasty than previous versions I made using dairy or other alternative milks, such as almond. As with any soup recipe, it always tastes better the next day, so I make it a day ahead of serving. This recipe is very versatile, and you can use pumpkin, butternut or kabocha squash with equally-delicious results! This recipe makes about 4-6 servings, depending on the size of your bowls and appetite. Preheat oven to 425 degrees Fahrenheit. Carefully halve the squash or pumpkin and scoop out the seeds. Place the squash cut sides down onto the baking sheet, and add about 1/4 of water to pan. Cover with foil. Roast for 35-40 minutes, until the flesh is easily pierced through with a fork. Set squash aside to cool slightly. If you're using canned pumpkin puree, skip steps 1-2 and move right onto step 3. Heat 3 tablespoons avocado oil in a large Dutch oven or heavy-bottomed pot over medium heat. Once the oil is shimmering, add onion, garlic and salt to the skillet. Stir to combine. Cook, stirring occasionally, until onion is translucent, about 8 to 10 minutes. In the meantime, peel the skin off the squash and discard. Add the cinnamon, mace, cloves and a few twists of freshly ground black pepper to the pot, followed by the squash flesh. Pour in the broth. Bring the mixture to a boil, then reduce heat and simmer for about 15, to give the flavors time to blend. Once the squash mixture is done cooking, stir in the coconut milk and maple syrup. Remove the soup from heat and let it cool slightly. You can use an immersion blender to blend this soup in the pot, or transfer it to blender for a smoother consistency. Working in batches, transfer the contents pan to a blender to blend and be careful not to burn yourself with the steam (don't try to do this with extremely hot soup, or your blender may explode!). Ladle soup into individual bowls and season to taste.